Soon, little ‘boils’ and ‘ghouls’ will be dressing in costumes and hitting the neighborhood streets going door to door asking for candy. One day out of the year, this surprisingly works! Perhaps this was all a big scheme cooked up by candy-makers, or perhaps it is the threat of tricks that earn these little costumed kids their treats. In any event, one thing is for certain: those little goblins are gonna come back sticky and covered in chocolate. 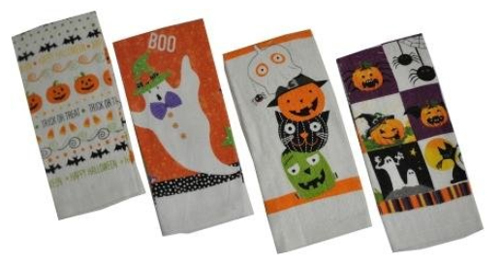 Be at the ready with these Halloween Kitchen Towels . They probably won’t be scaring anybody with their fun designs, but that’s okay — certainly, the prospect of candy-covered fingers touching everything in the house is much scarier than a smiling Frankenstein or ghost!